An asymmetrical bob is shorter in length and cut into a bob that’s uneven, where one side is longer than the other. Having a big comeback this year, this all-time fashionable hairstyle caters to all types of faces and hair texture without needing too much maintenance! It’s wonderful for women looking to add some flavor to a classic bob. It goes above the standard look and is more fun, as it takes the bore away from a simple haircut! You can go blunt for more accent or curly and wavy for added flare and customize it with color and a fringe. The best thing is that you can have the length and angle adjusted to suit your face shape or depending on the facial feature you want to highlight. 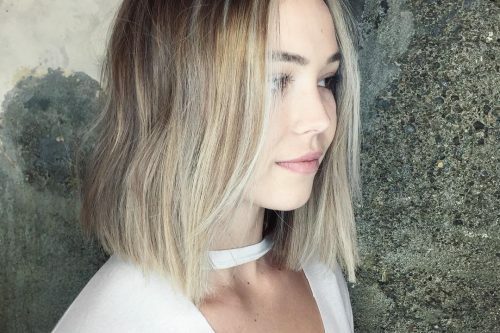 Here are the top inspiring asymmetrical bobs I’ve spotted on Instagram for you to choose from if you decide to embrace this adorable trend! Sport an asymmetrical bob with an undercut for an all-out high fashion outcome! A shadow root also adds interest and contrast against a light blonde hue like this. Show off your new vibrant red hair with a choppy deep side-parted lob! Lobs like this are a fresh summer look that goes beautifully on any skin complexion. Asymmetrical bobs and long bobs can be combined because one side needs to be longer and this allows for more length. 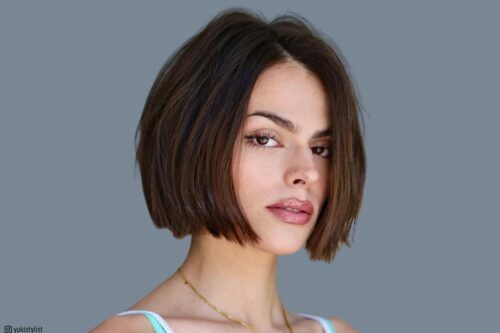 This super straight blunt chin-length bob that has one side going a little past the chin is a charming way to enhance your facial features. Not to mention that deeply parted hair and the subtle balayage – this look is an innovative one. A dark espresso color on a bold and beautiful brunette rounded cut couldn’t be any more fabulous without those face-shaping pieces in front. What bolder way to show off the unevenness of your hair with straight-cut ends?! It creates a sharp definite line that adds to the edginess of your look. No hair type is an exception for the attractiveness that an uneven haircut gives. 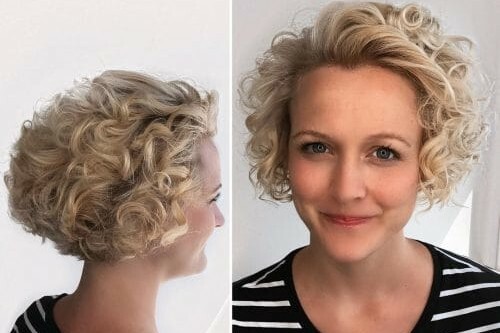 Get your creativity on by trying this beautiful shape if you have short hair with natural curls. Take a plunge with a new and cool long pixie that has shaved sides. It screams rocker chic and would allow you to accessorize your ears and neck glamorously. Defy the normal with this super high fashion unequal haircut! The blunt straight bangs and that vibrant magenta all add to its exquisiteness. A short asymmetrical bob hairstyle brings an extra detail to the facial area so it is great for masking other areas. 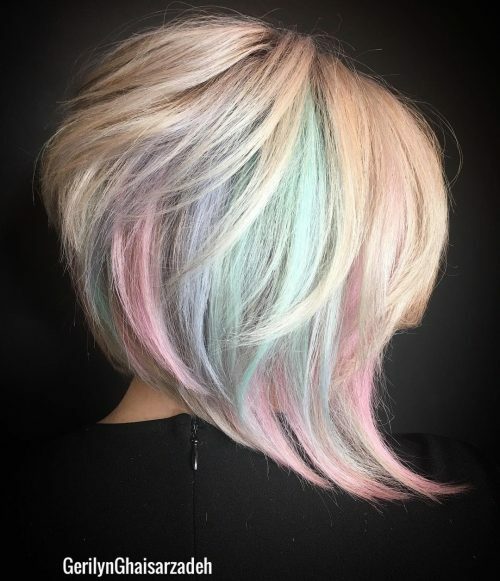 We’re obsessed with these enchanting pastels played on an angled layered cut. If you have short hair, it’s a subtle way to be unconventional and still look professional at the same time. 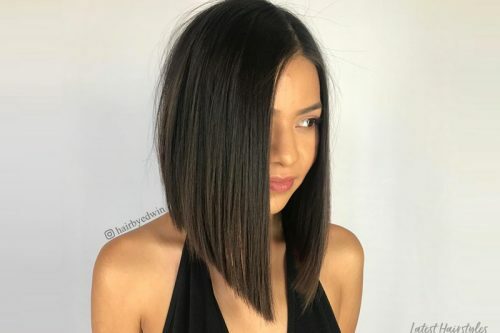 Inverted and asymmetrical bobs use cutting techniques to create inspiring haircuts. 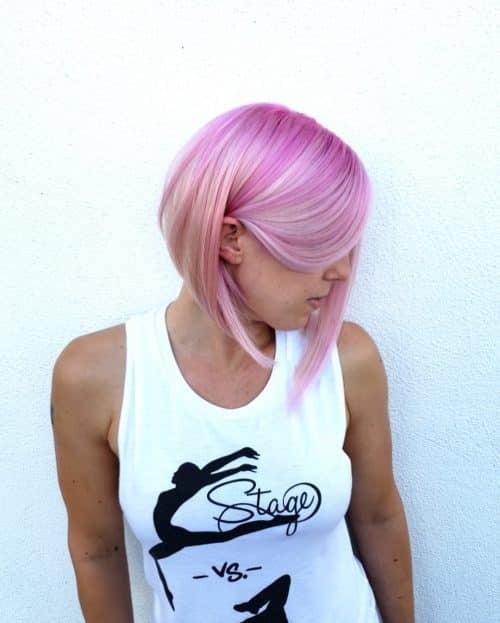 A delectable pink lob with hints of peach undertones is super complementing on warm to neutral complexions. 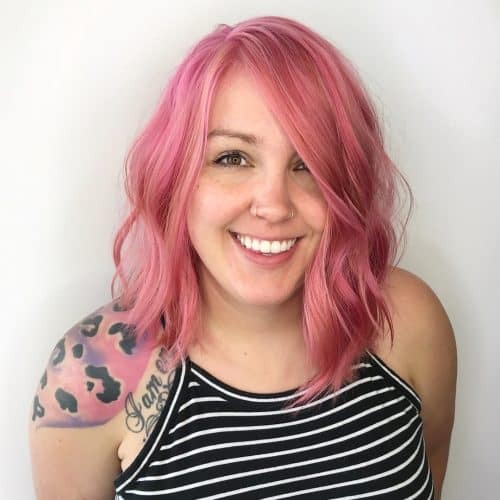 This princess bubblegum, asymmetrical bob might need upkeep with its color, but surely it’s worth it for any woman to try. Want to do something exciting with this old classic short cut? Leave some fun and longer wavy pieces at one side for a stylish finish. 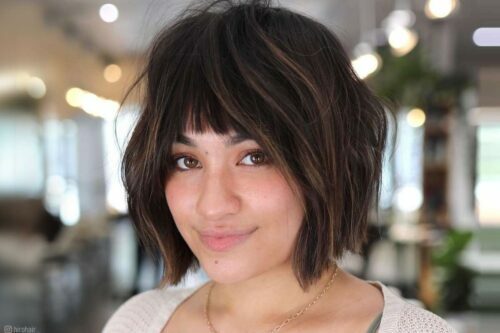 This particular look is an asymmetrical, collapsed bob. 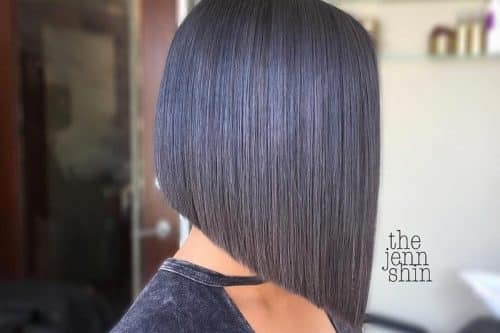 The difference between this look and a typically graduated bob is that the effect is created by heavy texturizing below the occipital bone which “collapses” the shape and mimics the curve of the head. 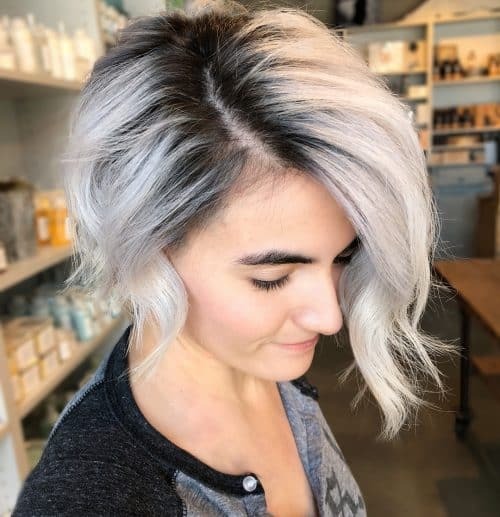 I love doing collapsed bobs because I find them much easier to style than a graduated design, and I think they have a more modern look to them. This color was actually done by me over six months before this photo was taken. I used OLIGO Clay Lightener to do some face-framing balayage and teasy lights and then toned with Redken Shades EQ Gloss. I absolutely love this kind of balayage for my brunettes specifically because of how low maintenance it is. Many of my brunette balayages get their color touched up only once or twice a year which is perfect for busy moms and working professionals. 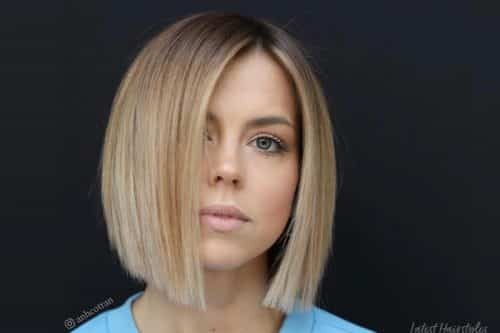 This asymmetrical bob could really be customized for just about any face shape except oblong as the length in the front might accentuate a long face. 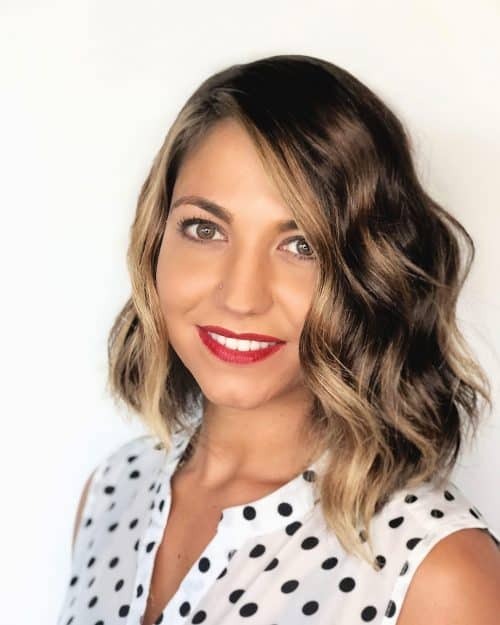 I would also recommend consulting with a client about their lifestyle before choosing a cut like this since there would be no way to tie the hair back, so they would have to be dedicated to either wearing pins or headbands if they run or go to the gym. 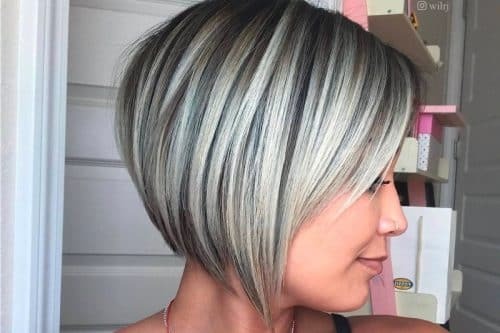 A style of this length also needs to be styled every day, so it would be important to really asses how much time you had to dedicate to styling your hair every morning. This look could be styled straight or curly depending on the hair texture. I would recommend blowing dry with a paddle brush in a wrap drying technique using a smoothing product like Pureology Smoothing Serum to smooth and straighten the hair. 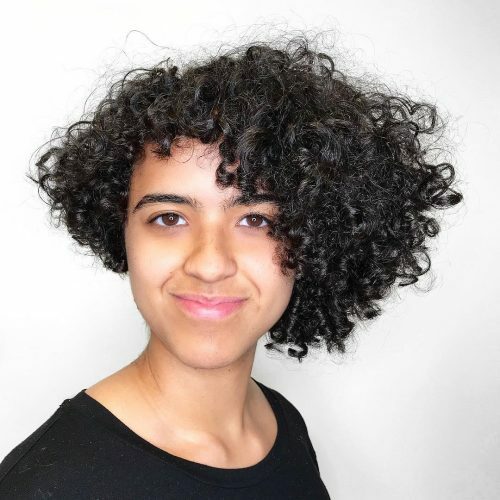 A client with naturally curly hair could also scrunch a curl activator, like Moroccan Oil Curl Defining Cream, and either air drying or blow drying with a diffuser. This look was blow dried straight and then curled with a 1.25inch marcel iron to create a slight wave. This dimensional red, asymmetrical bob on Melanie is a fun twist on a classic shape and style! 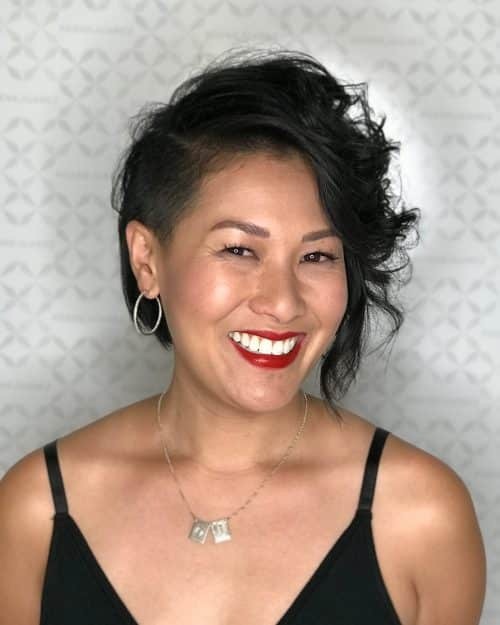 Melanie is a fashion-forward clothing designer who runs her own business, so we collaborated on this asymmetrical bob that can be sophisticated and playful. 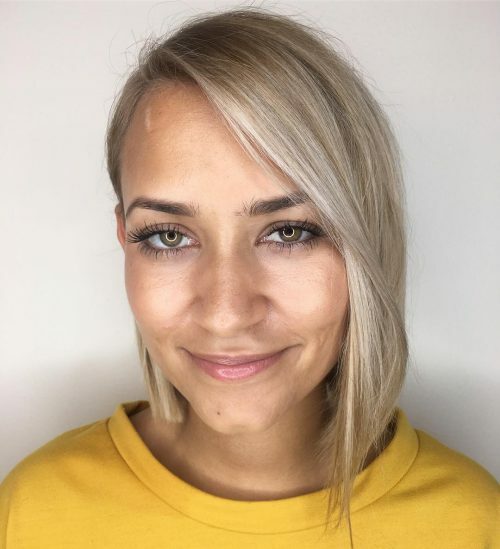 I especially love the out of the box color formula (we use Wella Koleston Perfect on the root, with Wella Blondor balayage pieces for subtle dimension and a Wella Color Touch Relights glaze for a rich, but sheer and luminous tone). Melanie has natural level 4 hair, so we throw a little level 10 into the level 7 intensive red formula to get that extra bump of lift. I’m a Wella Master Color Expert and have always loved the notion that once you know the rules inside and out, you can problem solve by bending or breaking them! The great thing about an asymmetrical bob is that it’s actually quite user-friendly! There are several styling options, depending on your hair type and texture. Wavy or curly hair can look great with a curl-enhancing product scrunched in damp and air-dried for an easy, laid-back look. Melanie wanted some texture in her straighter hair this time, so we did a loose, slightly crimped wave with a flat iron. She sometimes prefers a sleek look and we flat iron it straight. It all depends on your mood, which is what makes it a versatile style (but with an edge!) I tend to like this cut best for thicker hair and oval, slightly round or heart-shaped faces but again, rules are made to be broken! I would have to say “versatility.” By creating soft graduation above the nape undercut and maintaining long layers, she is able to create many looks. She can wash and wear with little to no styling effort or add some flat iron bands around the crown to sass it up, create volume, and provide movement. Also, she can flat iron for additional smoothness for a sleeker dramatic appearance. By giving it a severe A-line shape it still enables her to pull it back for her active lifestyle and work requirements. 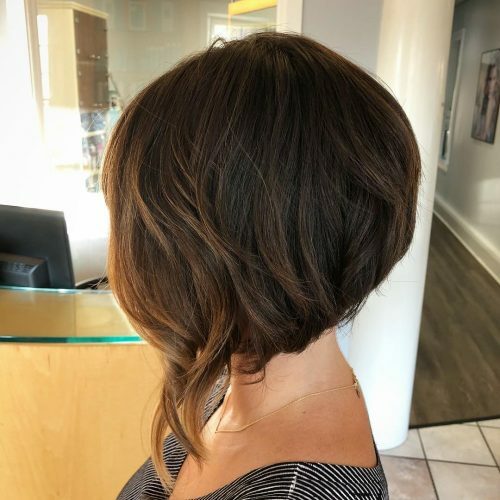 Although it may seem like an extreme style for most, this particular asymmetrical bob haircut can be adjusted in so many different ways. It’s almost never that I discourage a client away from it. If your face is rounder, this works really well as it elongates the face shape. If your face is longer and depending on the hairline, I may decrease the angle and bring the length up-to or just below the chin in the front. I may suggest a heavy side fringe to help broaden the cheekbones. The different hair textures, density, willingness to maintain, and the ability to style will determine the need for an undercut, the severity of the graduation, and where I place the layers. Typically I suggest a 6-week pre-book to keep this always looking consistent and fresh. However, it appeals to the low maintenance guest as well, as this can grow out beautifully. Because of the starting perimeter shape and angle, when growing out it becomes less concave and can appear more round, which is nice too. So depending on the starting angle of the cut, it can take months before it completely losses all shape, becomes more convex, and looks like it is drooping or sagging from the back. This is a very edgy textured look. It’s slightly asymmetrical which makes it fun but also gives the client the option to straighten it and keep it sleek and classy. You can’t tell in the photo but she actually has a pretty big undercut in the back. So we have to keep that shaved so it doesn’t get shaggy. Overall this whole look (color and cut) is high maintenance. Also, it’s a long process to get to in the first place. Anyone considering this look should be prepared to put the money and time into maintaining it in the salon and at home. “This may or may not have been a break-up makeover,” I say if you are down a boyfriend then in with fiery sunshine and an exciting new style as a pick-me-up! This client was ready for a major change! Her hair was long and she wanted it gone. She brought in 3 pictures and from that, I talked to her about what would accentuate and complement her features as well as what I thought would be realistic for her lifestyle. She’s a literal wash-and-go type of girl so I did my best to work with not only her natural wave pattern but her growth patterns as well so the hair would fall where we needed it to. She’s outside a lot so she uses a light serum. When I took this picture I literally just ran my fingers through it to move it in place after rough drying it with a blow dryer. The curl/waves you see are all natural. I believe being realistic about what I see when I look at my client and their hair and working together for a cut that meets their needs is always best. I look at their profile sitting and standing and head on and from behind. I watch them move their head and talk. I look for wave and growth patterns. I ask them what their favorite feature is and what is their least favorite feature and try my best to work with those things. 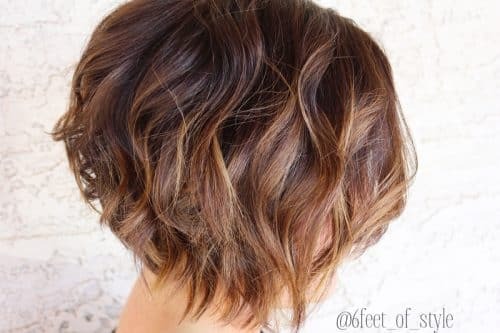 This look is a textured, asymmetrical bob with a chocolate base color that melts to a milk chocolate/caramel color. The coolest thing about it is the texture and dimension. I tend to really love things that have asymmetry to them, and dimensional hair color helps bring out the best in a haircut. I love using a curling iron or wand to add waves and texture to the hair. Definitely go for it!! This specific client has lots and lots of hair, but I’ve also done this on people with thinner hair. All hair types can really pull off this asymmetrical bob! Face shape can determine the length and layers with how short or long we go. On this client I used Aveda’s glossening straightener on wet hair, then damage remedy daily hair repair on dry hair, before curling. I finished her with Aveda’s Control Force hair spray. This cut works for any lifestyle because depending on how long it’s left, you can still get it back in a ponytail. 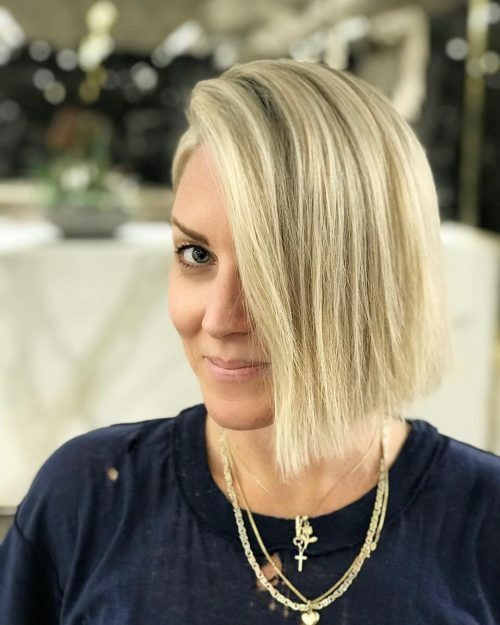 The “Lobsymetric” – it’s definitely a twist of a current trend which is “the lob” (long bob). By adding the asymmetric element it shows off the length of the lob and adds a quirky wearable boho vibe. This asymmetrical bob haircut was designed on a heart shape face. By having a longer side it adds a softness to the look and creates contrast with the shorter side showcasing the bone structure. Rough dry the hair for some natural texture and volume. 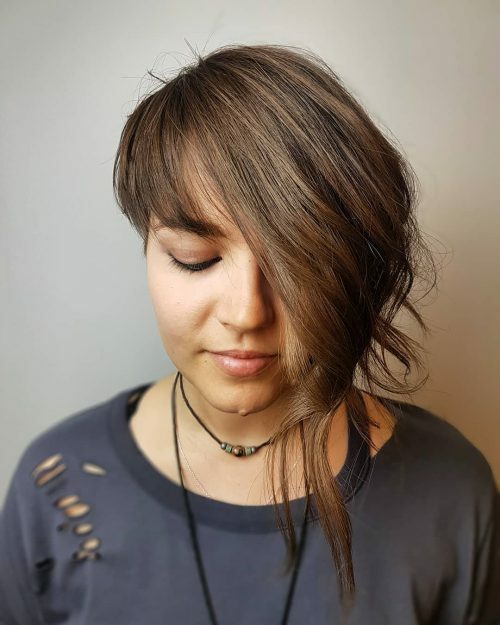 Afterward, lightly tong through the longer areas to create boho indie waves to break up and soften the strength of the hair. I used L’Oreal Techni Art Pli when blowdrying to enhance natural texture in the hair and create a structure for the waves to hold, and then I just waved the hair and I finished my asymmetrical bob with a mix of Paul Mitchell super skinny serum and Redken n12 rough past. This mix is perfect to define and soften waves as the serum smooths and glosses the hair while the wax defines and breaks up the waves and showcases the texture all while keeping the hair in place for the whole day. 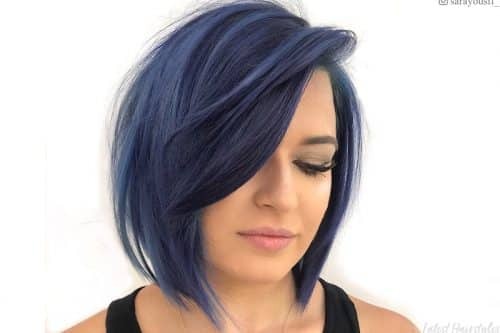 If you are thinking they have this style it is great for all hair types and all lifestyles, as you can wear this look sleek for a more professional look and messier casual for leisure time. 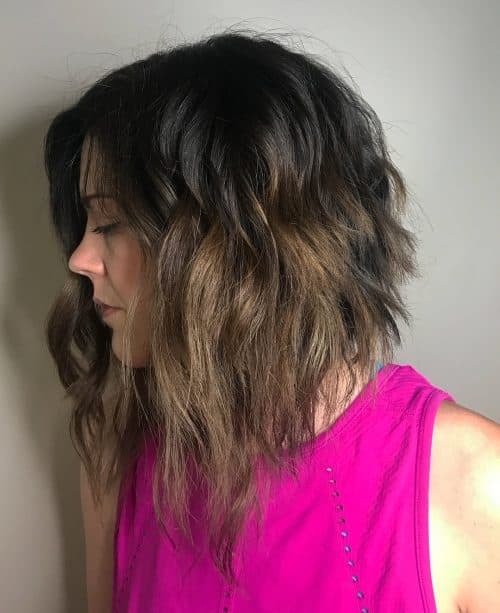 The greatest thing about this wavy asymmetrical bob is the textured cut that is so fresh and fun! She has a lot of hair, so I wanted it to still have movement but not look too heavy. I achieved that by razor cutting, point cutting, and texturizing. I did balayage her hair doing a little more highlighting around her face. Finishing this asymmetrical bob hairstyle, I used a marcel curling iron. There are many irons out there that can be used to get this wave. A razor cut asymmetrical bob justs looks a little edgier. It’s really great for most face shapes and hair types. It’s a fun way to make a change if you want to cut some length off but may want to grow it back easily. When styling you will need to use a mouse or styling cream (depending on your hair type) for some added control for blow drying and curling. Some heat protectant is always a good idea, especially on color-treated hair. After curling, comb or brush through the waves using a wide tooth or vented brush then finish with a medium hold hairspray that will leave the hair looking soft and touchable. This client first came to me a year ago as a color correction. She had long, dark brown hair with bands of red and black, and brassy foils. Her dream hair was bright, sandy blonde. 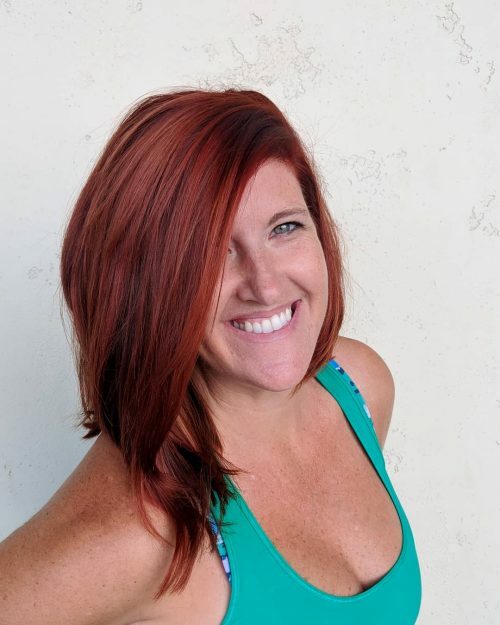 This client has been amazing – she understands that great hair often doesn’t happen overnight. It takes persistence and dedication. This blonde took us four appointments. 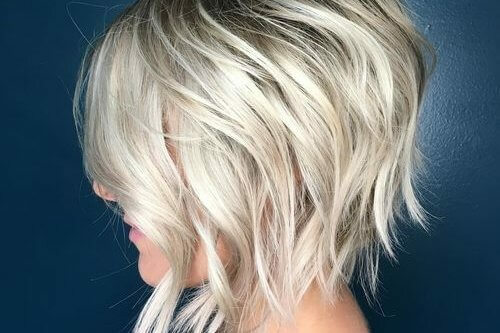 I love how natural the blonde looks, and how the color really compliments the cut. I think this haircut is a softer, trendier version of the asymmetrical bob from a few years ago. 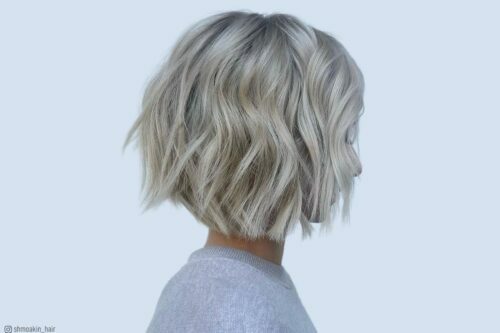 I absolutely love the long layers, and how textured and effortless this cut is. I’m a big fan of using both the scissors and the razor – scissors to keep the lines of the haircut clean, and using the razor to texturize keeps it light and soft. The greatest part of this cut is the drama of the sharp angle near her face. Are you prepared to commit to this style and keep it cut to the hairline? This haircut will look completely different at a longer length. Where will the long point hit in the front? Chin length? Collarbone? How steep is the angle? 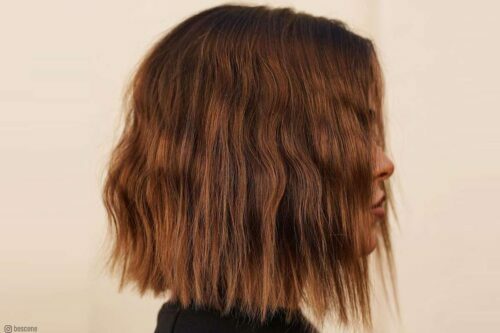 Do you like a stacked bob or a one-length bob with texture? Do you have the time and enjoy styling your hair? This look is not a wash-and-wear. It will need to be styled with a round brush, flat iron, or both. When considering an symmetrical bob, I like to think about face shape, as well as the length of the neck. If you have a shorter neck, the bob may almost touch your shoulders. If you have a long neck, a chin-length bob may look way too short. A bob will look completely different on every face shape and body type. A thorough consultation is absolutely crucial to creating a asymmetrical bob that you love!